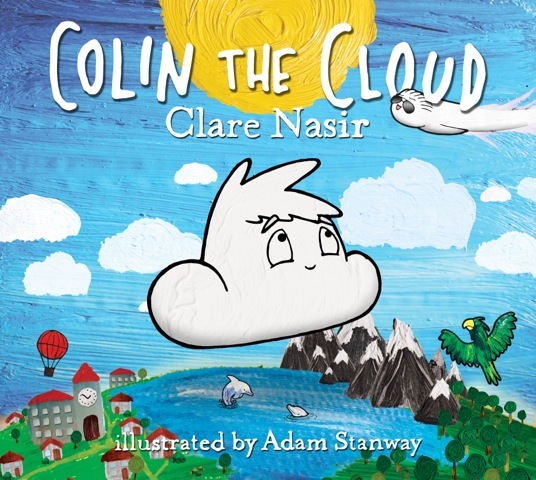 Colin the Cloud is a wonderful story of an individual realising their dreams. Colin is a little cloud that lives in the lower part of the sky, and for him life is boring. He wants to travel the world and see its wonders. So he seeks the guidance of a wise old cloud called Arif. Together they embark on an adventure to reach the top of the sky, where strong winds, the Jet Stream, take clouds on global routes. However the journey to the top of the sky involves hitching a ride on the powerful updrafts that exist within huge thunderstorm clouds. These angry clouds are the most dangerous in the atmosphere, and there’s a high risk that Arif and Colin could be struck by lightning and plummet to earth as a hailstone, never to be a cloud again. Colin makes it to the top – but Arif doesn’t, he secretly has other plans. Colin the Cloud is a rhyming story for 4 to 7 year olds. As well as being packed full of fun and adventure it has some key learning points about weather and simple atmospheric physics. The key focus is wind, and how air travels up and down as well as horizontally. The back pages of the book bring to life the dynamics of a Thunderstorm, and are a great talking point for parents and their kids and a perfect platform for a school lesson on weather. Clare’s meteorological expertise, and journalistic experience coupled with being a mum of a four-year bring the elements of storytelling and solid science together. Colin the Cloud is the first of a set of five books.